Everybody loves good stuff right? I know I do! So here's some things I've been enjoying lately in the style K likes to do it. Fresh Meat. Last night LB and I finished watching Fresh Meat. It's a British show on Netflix that ran for fours seasons, finished last year and is highly enjoyable. It's got everything you'd want from a British sitcom. Dorky humour. Infantile humour. The two cornerstones of British comedy! 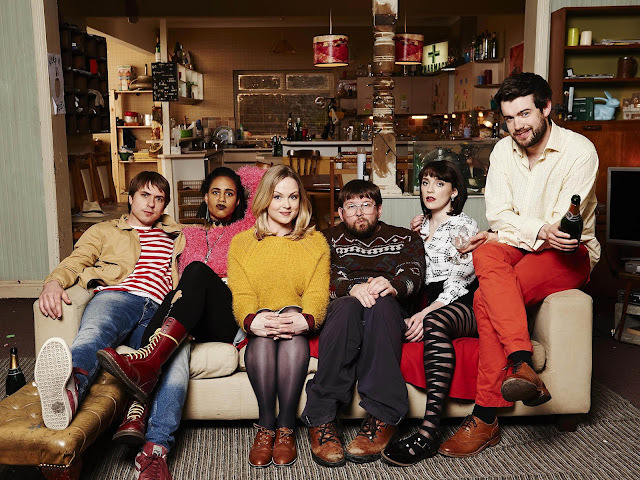 It's about these uni students living in a share house in Manchester and each is both awful and loveable. And every episode I would laugh at loud, usually on more than one occasion. Out loud! That is something that doesn't happen everyday. Ha. I mean I laugh out loud every day. Probably hundreds of times but not at the TV. That is something special. Missing Richard Simmons. The other day I started listening to this new podcast mainly because it was at the top of the podcast charts, but also because it seems quite interesting. Did you know that in 2014 exercise entrepeneur Richard Simmons suddenly stopped teaching his exercise class, stopped all public appearances and stopped speaking to his friends. No me neither. I just thought his schtick was too 80s-90s and no one cared about him any more. But apparently he just dropped out of life and this podcast is trying to find out why. I don't know how far they'll get but the first two episodes were very enjoyable and I'm regretting not being 6 months behind like I usually am which allows me to binge listen/watch things. This way I need to wait for weekly instalments. Ugh. It is like living in the 90s. Being at the pool. Yesterday I went their twice. Once in the morning with Pickle and Baby Pickle and then in the evening with my boyfriend and my babies and a picnic basket packed with a ploughman's lunch for dinner. Yeah boyyyyeeeeee! I know how to live! Summertime!!!! WOOOOOOOO!